These new Dragonfire Brown Buckers offer you the chance to “get some” in the best possible way! The Brown Bucker pickups are great for that late 70’s, early 80’s sound. They deliver the big, brown sound while still rounding out the bottom end and delivering at the high end. Choose a single humbucker bridge, a single humbucker neck or a matched HH set that is collaborative so the pickups will work in conjunction with one another for best possible performance. The Brown Buckers deliver intense performance and are especially recommended for rock and classic rock genres. 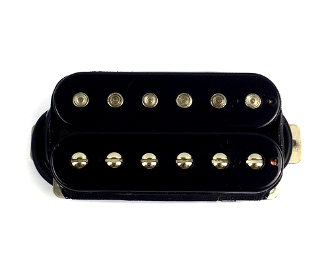 The Alnico V magnets featured in these pickups provide warm, creamy, vintage tone. These pickups feature 1 row of flat top slug-style polepieces and 1 row of 6 adjustable-screw style polepieces that are great for personalizing your playing style. These humbuckers are 4-wire so you can coil-split for even more versatility. In single coil mode, this humbucker performs with clarity and functionality. For high-end performance, we recommend using 500K pots and 0.047 tone caps (available separately).